The following list describes LTE downlink physical channels and physical signals. Downlink physical channels carry layer 2 information but downlink physical signals are only used by the physical layer. Carries the DL-SCH and PCH. DL-SCH contains actual user data. Informs the UE about the resource allocation of PCH and DL-SCH, and HARQ information related to DL-SCH. Carries the uplink scheduling grant. Carries ACK/NACKs in response to uplink transmissions. Informs the UE about the number of OFDM symbols used for the PDCCHs; Transmitted in every subframe. The coded BCH transport block is mapped to four subframes within a 40 ms interval. The figure below shows the structure of the downlink physical channel and downlink physical signals. Uplink physical channels and uplink physical signals are as follows. Uplink physical channels carries layer 2 information but uplink physical signals are only used by the physical layer. Carries the UL-SCH, ACK/NACK and CQI. UL-SCH contains actual user data. Carries ACK/NACKs in response to downlink transmission. Carries CQI (Channel Quality Indicator) report and SR (Scheduling Request). 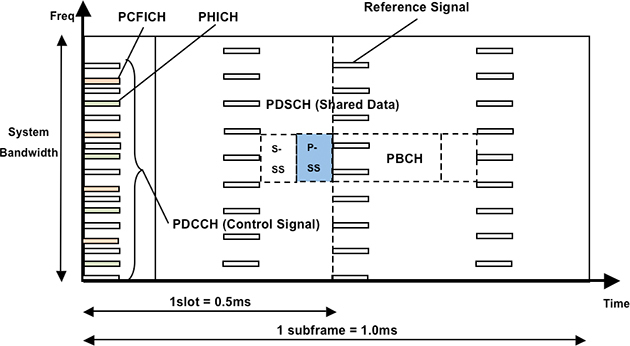 Demodulation Reference Signal (UL-RS), associated with transmission of PUSCH and PUCCH. 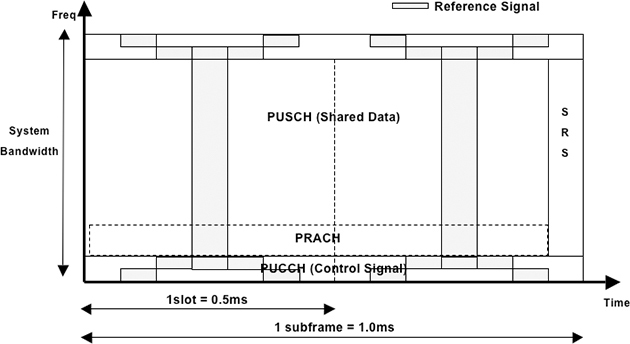 Sounding Reference Signal (SRS), not associated with transmission of PUSCH and PUCCH. The uplink physical channel and physical signal structure is shown below.